Dragonfly Ultra Light. Credits to: Moyes, for inventing this great Airplane. J. Rdiger for giving me the detailed 3 side view drawings of the Dragonfly. 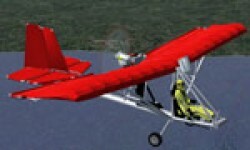 The guys who made the Quad City Ultralights Challenger for the aircraft. cfg file, so I could do mine out of this. The one who made the Skyseeker Microlight plane for Flightsim FS2004 FS9, its the Cockpit of this one. The guys who made the standard Curtiss Jenny in Flightsim FS2004 FS9, i took the 3D model of it from the Gmax Gamepack example file. Dragonfly Ultra Light. Rating: 6.33 of 10 over a total of 3 reviews.